I woke up several times during the night. We both peaked at the Dom all lit up. No! we weren’t having a fantastic dream – it was the real thing. In the morning, we went downstairs to the hotel dining room. Breakfast was included in our stay. It was a nice room with linen table clothes. There was a wonderful buffet: juices, a great variety of breads, German meats and cheese, scrambled eggs, sausage and bacon, fruits, muesli, and good coffee. A large coffee pot was put on our table. We left hotel about 10:30 for our first adventure. We had good maps and everything looked to be in easy walking distance. We decided to go back to Gross St. Martins (No. 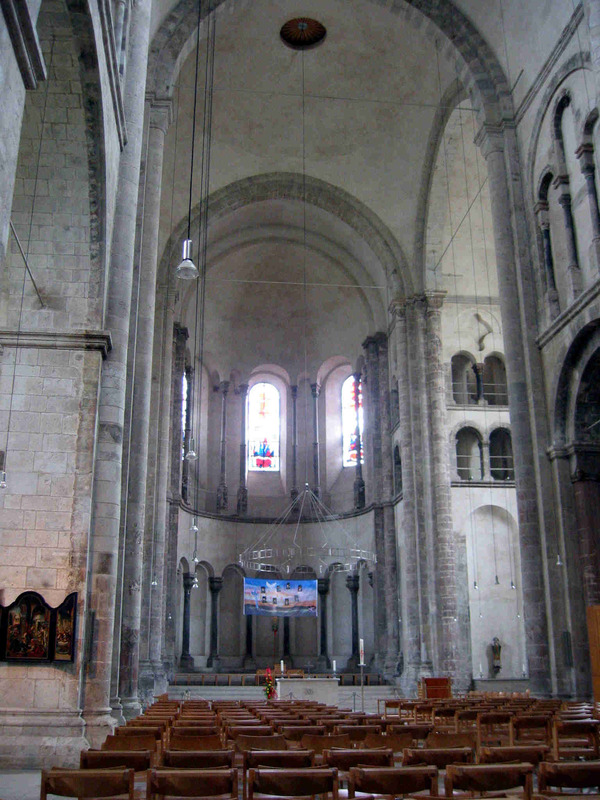 9 on map), one of the Romanesque churches we wanted to see. The Legendary founders, in about 960, were Pipin and Plectrudis. 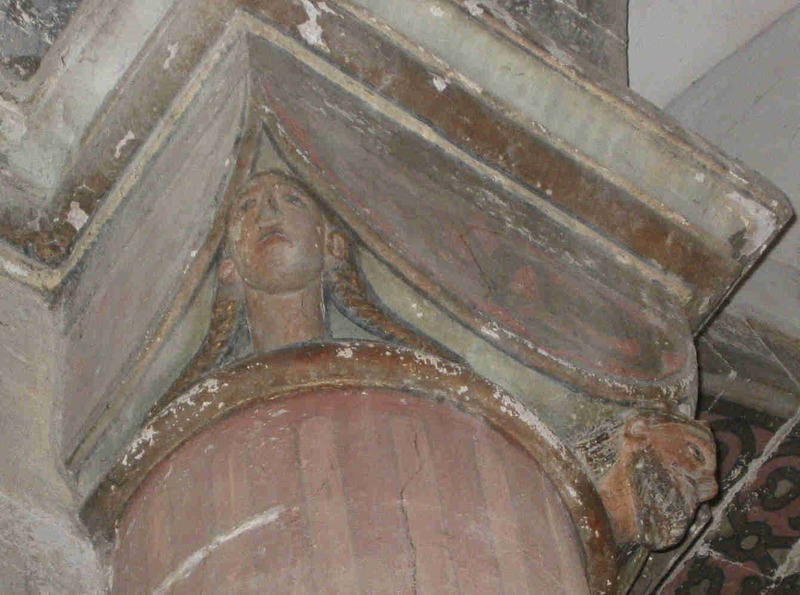 Their heads appear on capital of southern crossing pillar in present building. It was first a Benedictine Abbey. As is the story of so many churches, a fire in 1150 provided the opportunity for new, more spacious building The present building was constructed between 1150 and 1250. The choir and two transepts formed a four leaf clover effect. 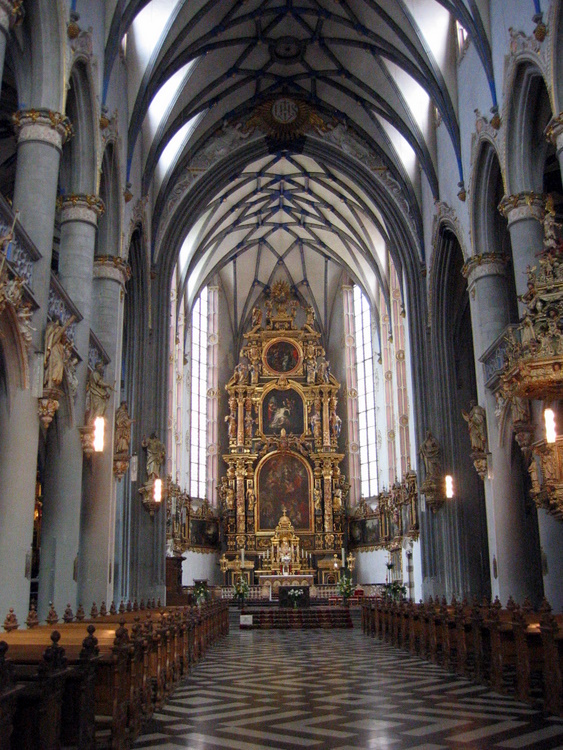 Gross St. Martin was first to copy the clover leaf choir of St. Maria im Kapitol which we will visit next. The roof was destroyed by fire in 1378. Then a bad storm in 1434 blew down 3 of 4 towers. The second half of 18th century brought modern changes which were meant with harsh criticism. 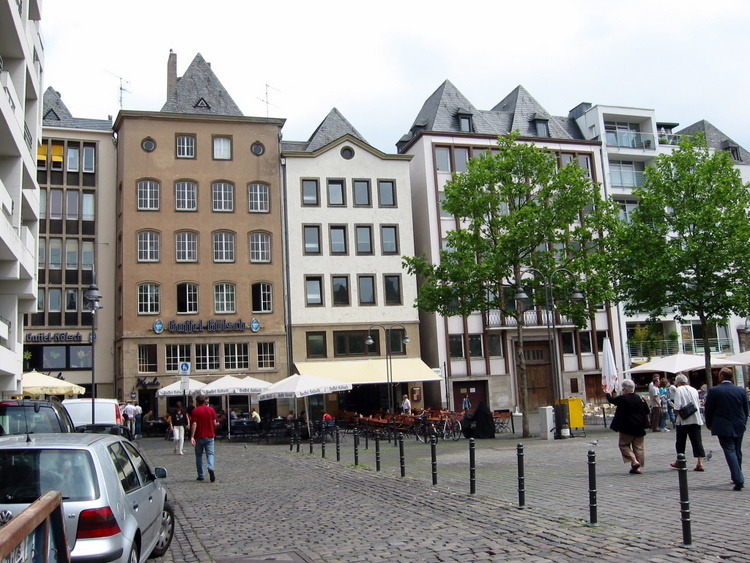 Five air raids on Cologne between 1940 and 1945 damaged Gross St. Martin substantially. It took forty years to reconstruct it. 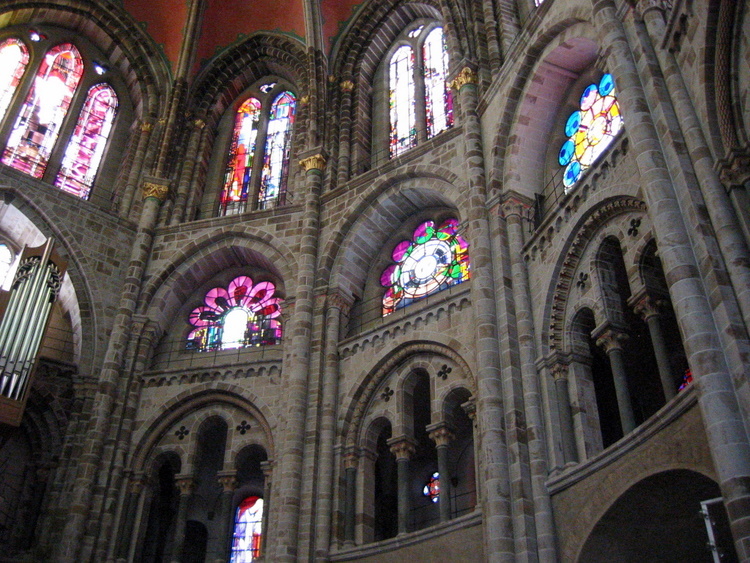 The church has elements of both Romanesque and Gothic styles. The crypt contains the Roman ruins. The location made it impossible to take a full photo. This is a copy of an aerial view. Upon entering there is a feeling of spaciousness, a real sense of the Romanesque style along with the modern… the banner over the altar, the huge model chandelier and the hanging spot lights. 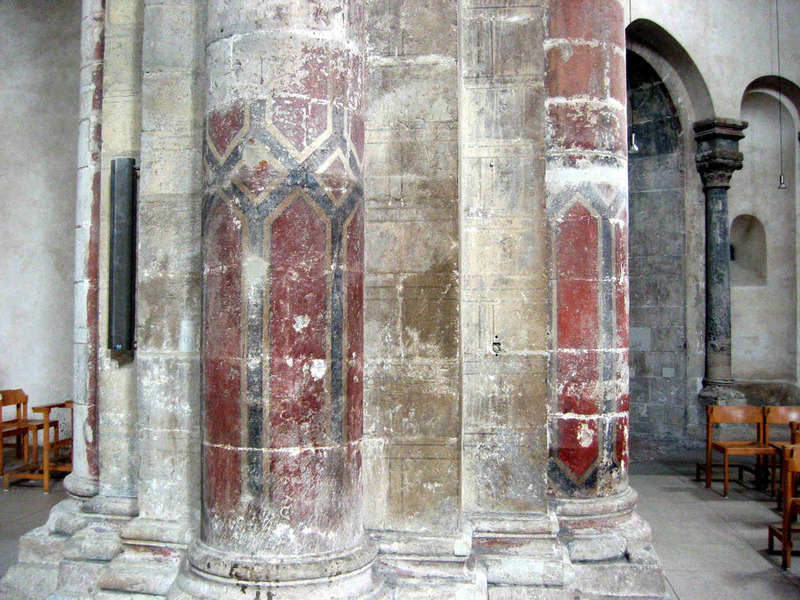 The old columns have traces of the once painted designs as found in many of the churches of that period. 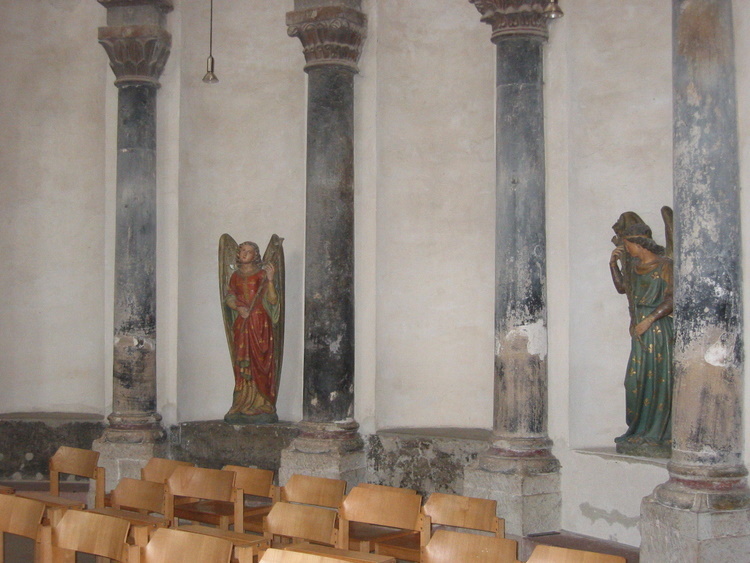 There are also several painted statues. The nave’s triforium level has blinded arches, that is the arches are enclosed. 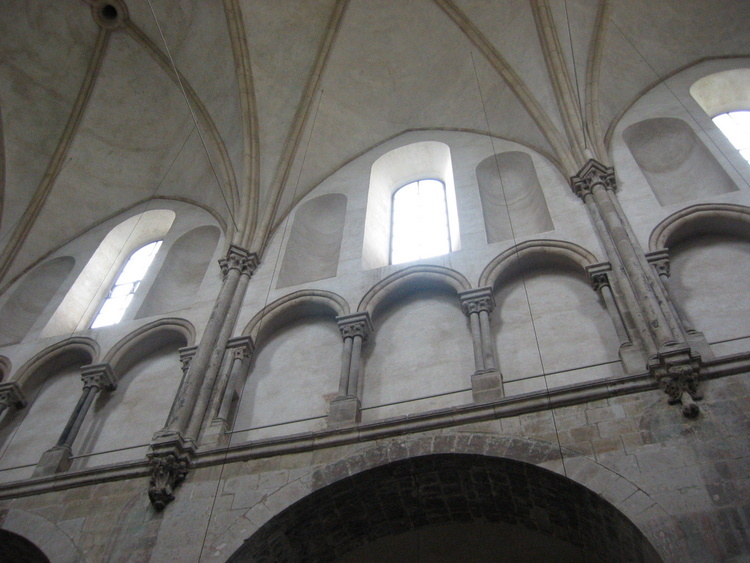 Above in the clerestory are clear windows flanked on each side by what appeared to be niches of the same size, but no statues. We walked from Gross St. Martin to St. Mary’s im Kapitol ( see map above # 7) which was built in the 11th century over a Roman foundation. 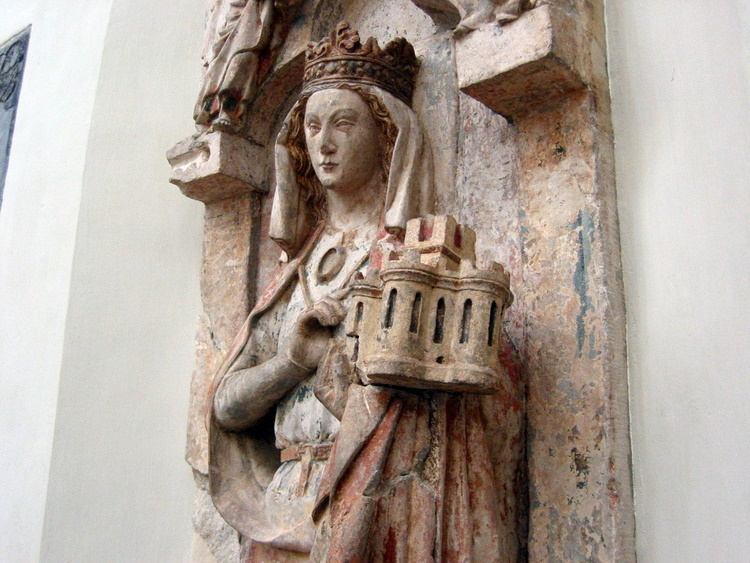 Early in the 8th century Plectrudis, stepmother of Charles Martel, founded a convent for women on this spot. Archbishop Bruno (954-965) transformed it into convent for Benedictine nuns and by 12th century it became a noble institution for women of rank. 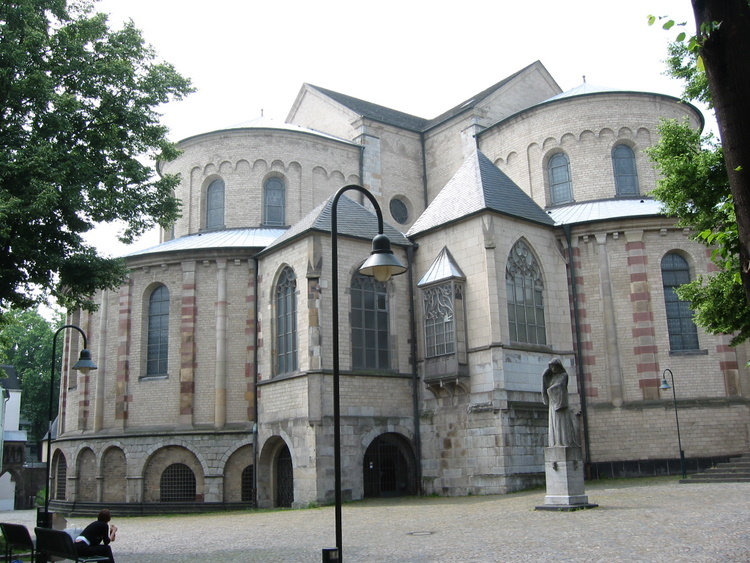 This church has retained the only cloister in Cologne. 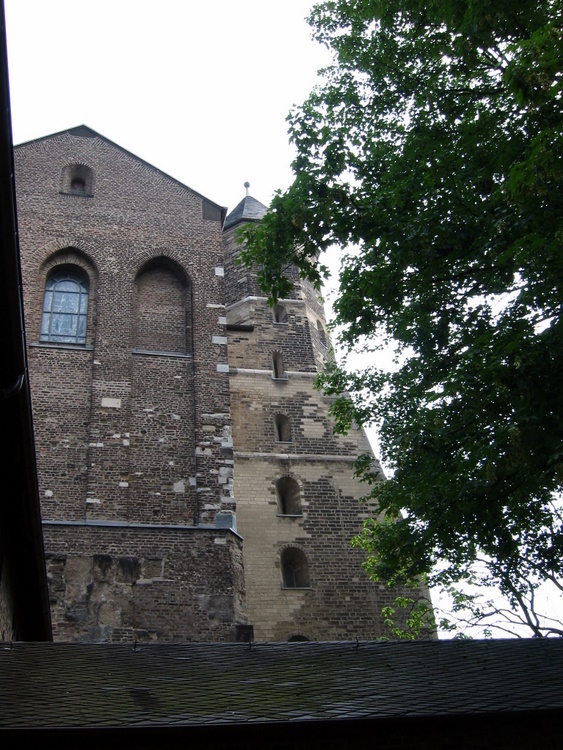 It was the first church in Cologne with a clover leaf choir. 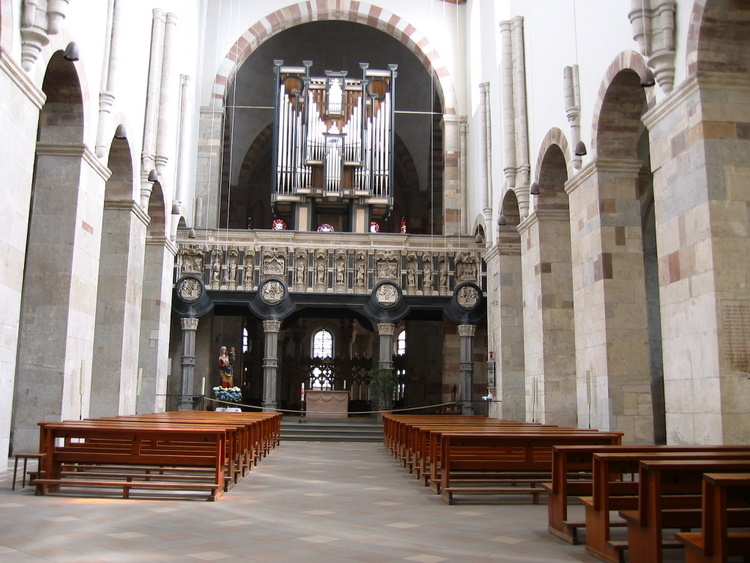 The interior was divided by a large rood screen on top of which were the org an pipes Immediately behind the rood screen was the main altar. Walking around behind the main altar were chapels in the three clover leafs. St. Mary’s im Kapitol was severely damaged during WWII but has been fully restored. There were pictures showing the destruction. 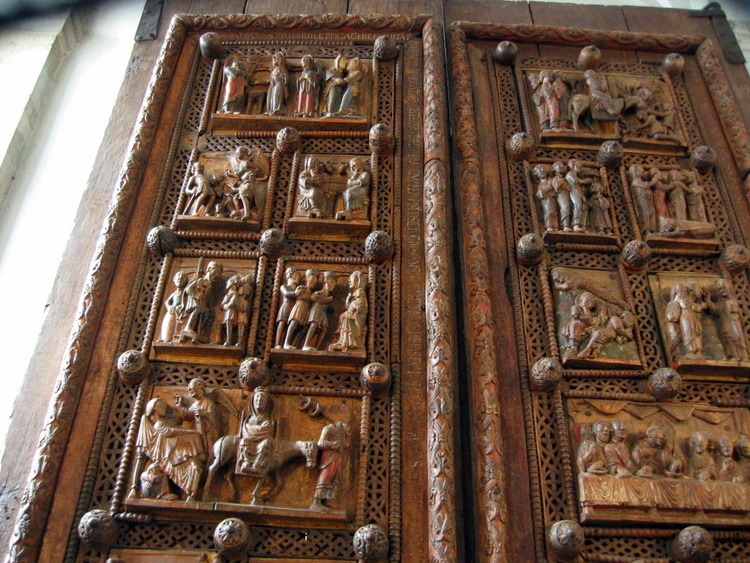 On display were carved wooden doors on the Life of Christ dating to 1065. We didn’t leave St. Mary’s until about 1:30, so we were hungry. We started walking back towards the Dom (cathedral). We went through a large square that was a market and had a number of outdoor cafés. It had become rather warm so we choose one in the shade - Gallel Kolsch. We had Cologne Beer. 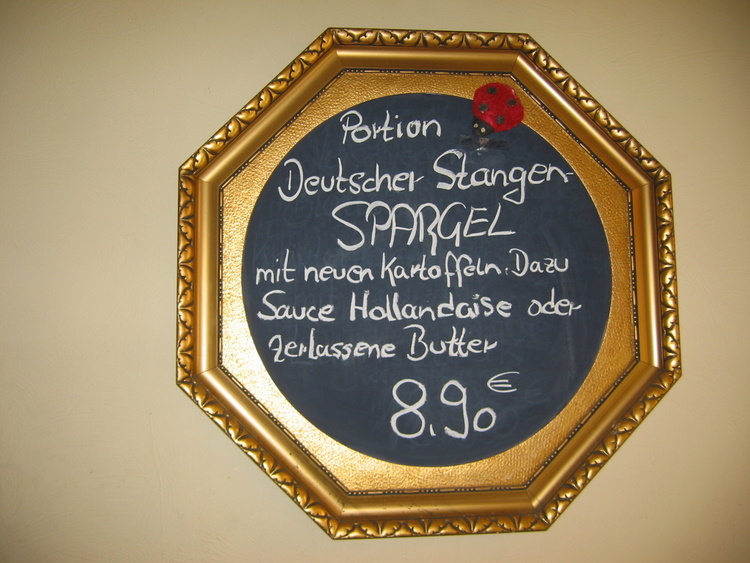 My wife had Spargel Hollandaise – very large white asparagus and new potatoes, more than she could eat. I had Katoffelsalat, potato salad, with a very long sausage – over a foot long. Both were good. As we found out way back towards the Dom (you can never miss it as the front towers are so high and there are no other tall buildings in Cologne), we found a gelato store and couldn’t resist and besides we needed to use their bathroom. 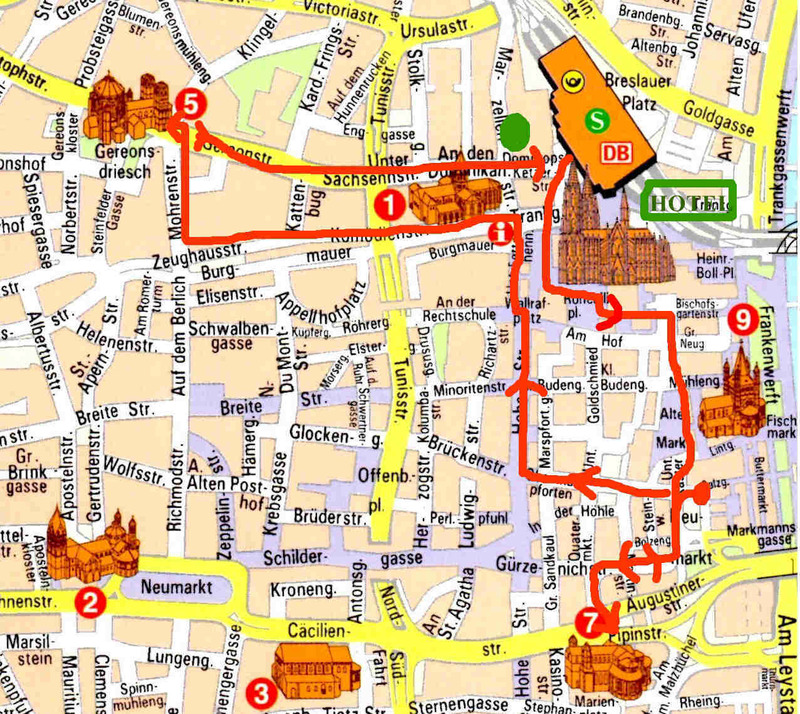 We walk back past the Dom and turned left and walked a number of blocks to St. Gereon (see map above no. 5). The architectural style goes back to late antiquity. The Roman building was constructed in the middle of a graveyard outside the city wall. In early Middle Ages there was a legend of St. Gereon and his companions from the Thebaic legion who settled in the area. It was over the remains of these martyrs that Empress Helen, the mother of Constantine, is said to have constructed the church. 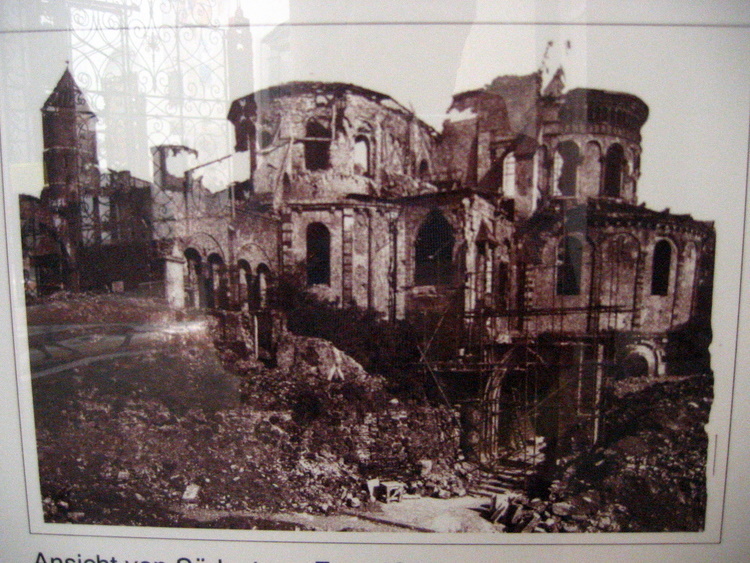 The Roman building is 4th century but constructed several decades after Helen’s death. Under Archbishop Anno (1056 -75) the first alterations of note were carried out. A long choir was constructed. The 13th century architectural style reached a high point. Later the building reached a terrible state of dilapidation. Restoration was started. An extra story was added to the dome which ranks among the largest of church domes. It is 112 ft. high and 69 ft in diameter. It was completed in 1227. The octagon shaped dome was spectacular with beautiful stained glass windows. 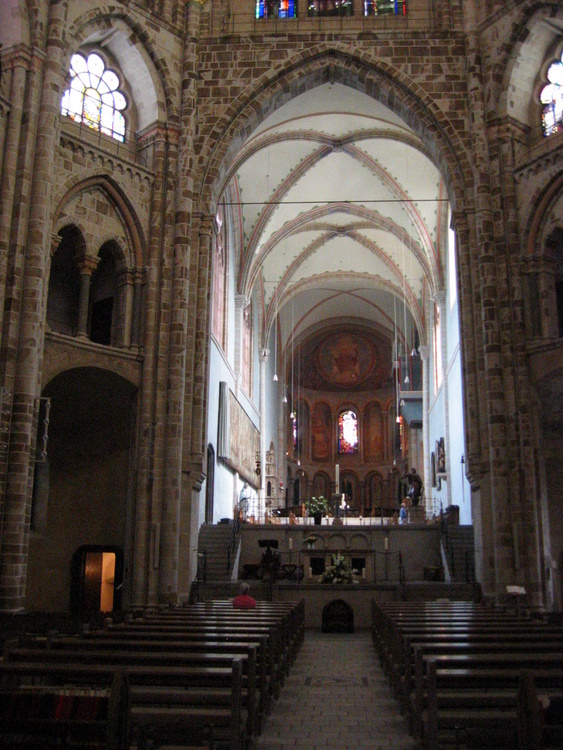 We noted how few visitors were in these Romanesque churches compared to the Dom. 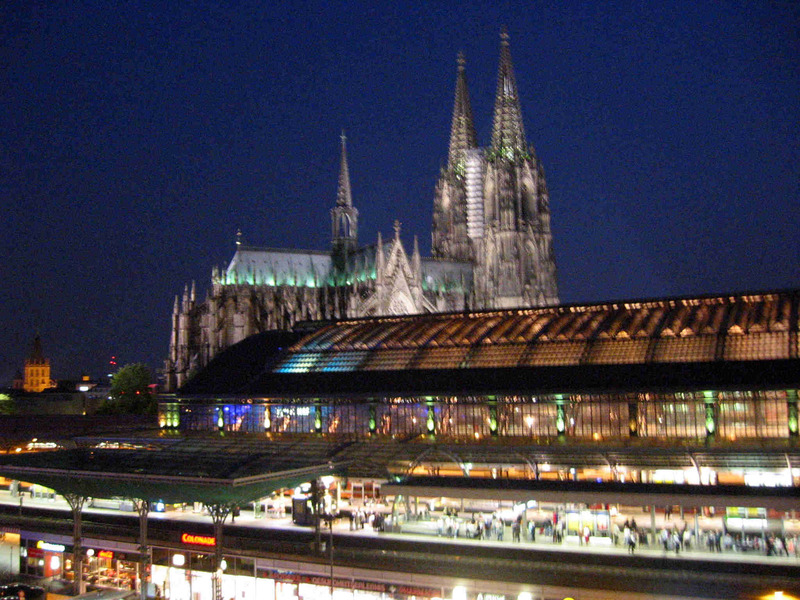 Our plan had been to spend considerable time in all twelve Romanesque churches, but this is the last day to explore Cologne so we were only had time to visit only four of these churches – an excuse to come back!! We hiked back towards to Dom and our hotel. We passed a Hilton and stopped in for a couple of rather “expensive” drinks. It was interesting to see that we were charged for the gin and the tonic! Fr om our hotel and from the plaza on the north side of the cathedral we could see a sort of pink Baroque Church. 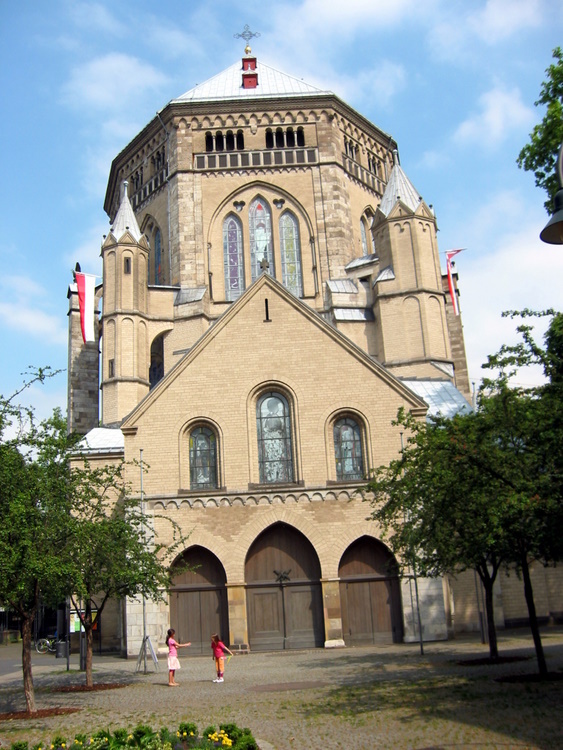 As we were walking from the Hilton back to our hotel, we passed in front of this church - St. Maria Himmelfahrt (St. Mary of the Assumption). It was open so we went in. It was very Baroque inside. 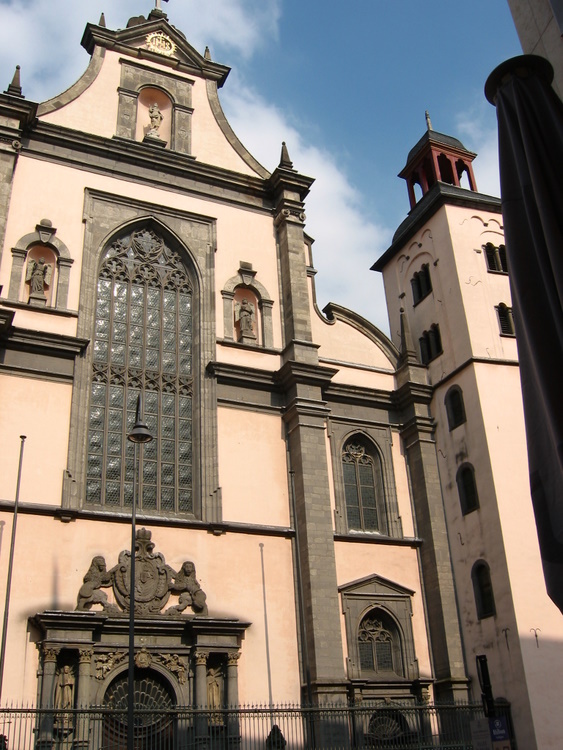 This church was originally built by Christoph Wamser for the Jesuits in 1618. In 1678 it was consecrated as a church and completed in 1715 with a Gothic style interior. 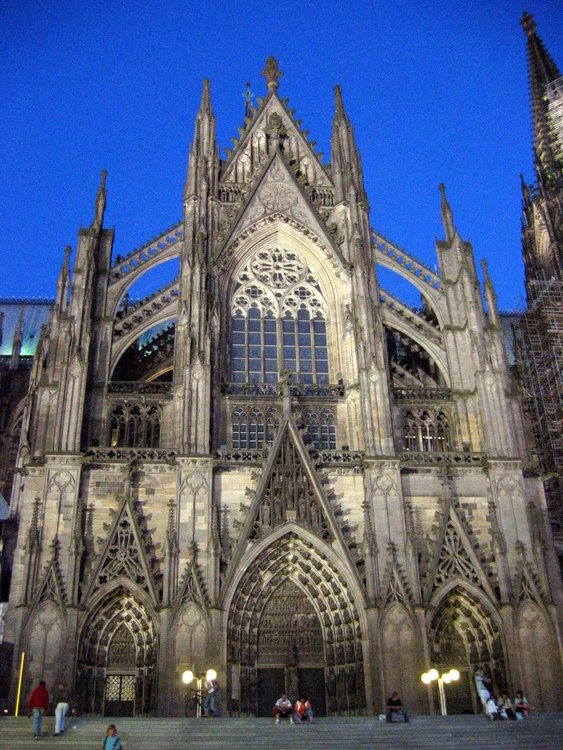 After the Jesuit order was removed from Cologne in 1773, the church was used by the French as a "Temple of Reason". After being destroyed in the war, the church was rebuilt in its original forms with a Baroque exterior and a three story high Baroque high altar. The rebuilding was completed in 1979. Then we went back to our hotel to change into our “good” clothes. We found one of the outdoor cafés along the river near the concert hall –Em Krutzche. They had Jim Beam!!! We started with Ganseterrine (Terrine pate). My wife had a Reibekuchen Lachs (Blinie with shrimp and salmon). I had Wiener Schitzel (two breaded veal) and fried potatoes. It was very good. It seemed like a lot of people who were going to the concert were eating in this and other restaurants along the river as the men had on coats and ties and the women were dressed up. 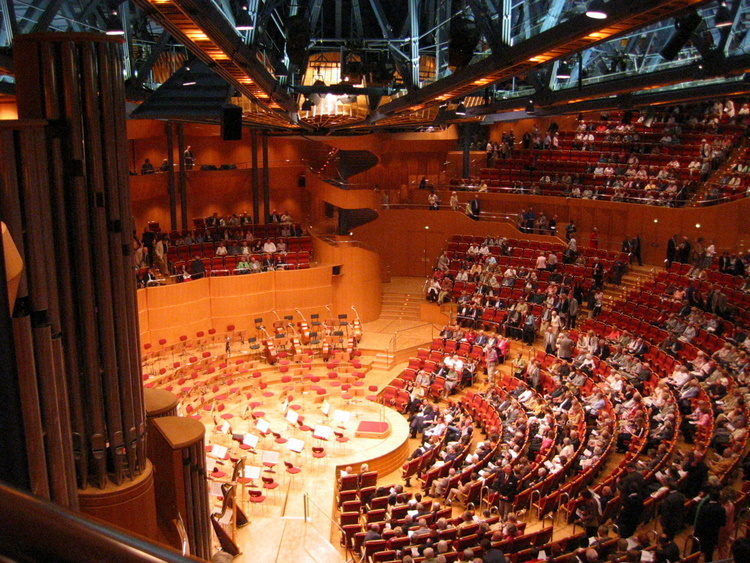 We found our way up the street to the Cologne Philharmonie. It was built in 1986 and is rather modern. The seats are in a semi circle with three tiers behind the orchestra. We had ordered the tickets on-line weeks before. They had arrived in the mail before we left home. We had gotten the least expensive tickets as we wanted the experience rather than have great seats. Our seats were in an opening in a hallway leading to the top of the main section. We had comfortable chairs and the view was great. We could see all of the audience as well as the stage. The hall was filled. Most everyone was dressed up. 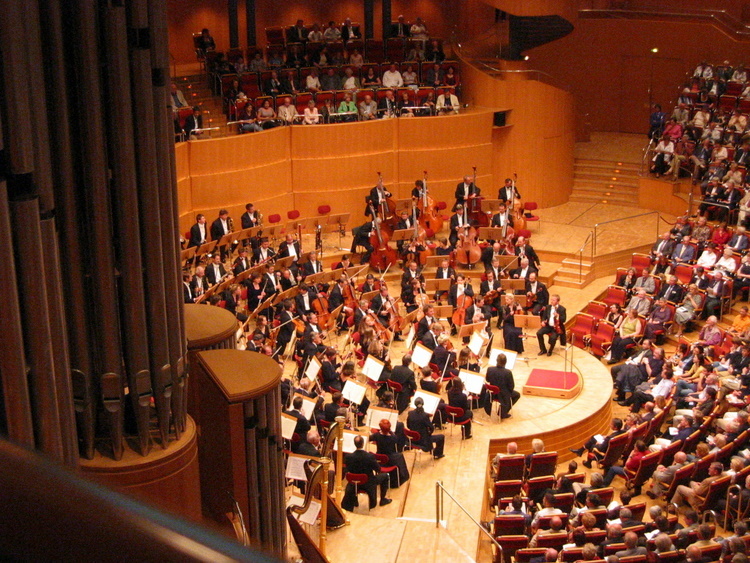 The Dresden Philharmonic was playing. They played Beethoven’s Fifth for the first half and then Wagner’s Tristan and Isolde, and Gotterdammerung. It was a wonderful concert and a great birthday present. Th e conductor had a number of encores. The applause when on so long that we thought they would play something else, but they didn’t. We walked home, which was just a couple of blocks going through the train station. It was a beautiful night and the Dom was well lit. This photo is the north (left) side facing the train station.